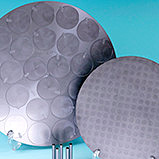 Ceramics|Precision Machining of Ceramics, Quartz, Tungsten & Molybdenum | Top Seiko Co,. 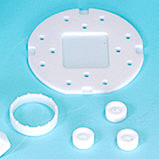 Ltd.
A wide variety of ceramic materials has been developed, and the machinability of these materials varies. Listed below are characteristics and machinability of ceramic materials that are widely used across industries. Machinable Ceramics Low Medium Very High They can be easily machined with tungsten carbide cutting tools. 5 Low High They can be effectively machined with diamond grinding tools due to their low hardness and low fracture toughness. However, sufficient cautions need to be exercised to avoid cracking & chipping. 4 High Alumina is the most popular ceramic material with good machinability. However, the machinability of lower purity aluminas is heavily affected by other compositions. 3 High AlN has machinability similar to alumina. However, it is more susceptible to microcrack formation and chipping due to its low fracture toughness. AlN reacts with water to produce ammonia gas while machining. Keeping machining operations cool is important to minimize the gas generation. Also, it is necessary to avoid water contact as much as possible to prevent surface from turning white. 6 Low Zirconia has low machinability due to its high fracture toughness. It is so tough that it can rapidly damage diamond grains of the grinding tool, causing excessive tool wear which will eventually lead to a catastrophic failure. Keeping sharpness of a grinding tool and replacing when sharpness is lost are crucial. 23 Medium Low Sapphire has extremely high hardness and can cause clogging on a grinding tool surface. Being a single crystal form of corundum, a crack generated during machining will eventually propagate and cause breakage of the sapphire product. Top Seiko specializes in precision machining of sintered ceramics with machine tools and diamond grinding tools. Listed below are pros and cons of machining sintered ceramics compared to green machining. PROS 1.Dimensional errors caused by sintering shrinkage and warpage can be corrected by machining fully sintered ceramics, making it much easier to achieve tight dimensional tolerances. We are capable of achieving tolerances as tight as plus/minus 3 microns (.0001") in machining ceramic materials. Our standard tolerances are plus/minus 5 microns (.0002"). 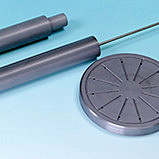 2.Delivering precision machined parts within a shorter lead time is possible because there is no need for sintering. 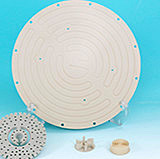 In addition, we have a wide variety of fully sintered ceramics in stock. 3.For prototyping and low-volume manufacturing needs, costs can be much lower because it does NOT need a mold which requires high initial mold cost. CONS 1.Longer machining time is required to machine sinter-hardened ceramics, which can lead to high machining cost. 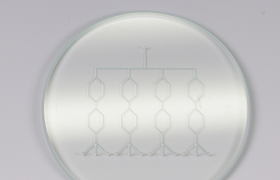 However, our lights-out production capability has successfully reduced cost significantly. 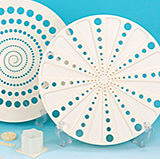 Also, machinable ceramics can be cheaper alternatives to advanced ceramics in terms of machining cost. 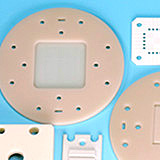 Let us help you select a machinable ceramic based on your application requirements. 2.Shortage may occur for high-volume products.